The following account of how Paphiopedilum spicerianum (originally known as Cypripedium Spicerianum) was introduced to cultivation in Britain in large numbers has been copied (with considerable abridgement by Brian Milligan) from Frederick Boyle’s book The Woodlands Orchids (1901). As the reader will discover, Frederick Boyle was a typical journalist of the Victorian era, with a considerable flair for the dramatic! “The annals of Cypripedium Spicerianum open in 1878, when Mrs. Spicer, a lady residing at Wimbledon, asked Messrs. Veitch to come and see a curious flower, very lovely, as she thought, which had made its appearance in her greenhouse. Messrs. Veitch came; with no extravagant hopes perhaps, for experience might well make them distrustful of feminine enthusiasm. But in this instance it was more than justified, and, in short, they carried off the marvel, leaving a cheque for seventy guineas behind. “… Importers sat up. They were not without a hint to direct their search in this case. The treasure had arrived amongst a quantity of Cypripedium insigne. Therefore it must be a native of the Himalayan region – Assam, Darjeeling or Sikkim, no doubt. 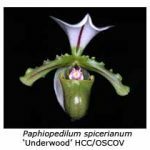 A good many persons along that frontier probably received commissions to find Cypripedium spicerianum. “At St. Albans (home to Frederick Sander’s great orchid nursery) they were more deliberate. It is not exactly usual for ladies residing at Wimbledon to receive consignments of Orchids. When such an event happens, one may conclude that they have relatives or intimate friends in the districts where these orchids grow…. A discreet investigation proved that this lady’s son was a tea-planter, with large estates on the confines of Bhutan. With the address in his pocket, Mr. Fostermann, a collector of renown (and an employee of Sander’s nursery), started by the next mail. To save space I have summarised the following page of Boyle’s account as follows: Fostermann then asked Spicer for a job, a request that was politely refused. However, Spicer generously invited Fostermann to stay with him (rather than at the dak bungalow) and suggested that he should go hunting with his manager. While shooting ducks with this gentleman, Fostermann cautiously brought the conversation around to orchids. “There was no need of finesse, however. At a word, the manager told everything. He it was who had found the Cypripedium that had caused such a fuss, when shooting on the other side of the river – that is, beyond British territory. Struck with its beauty, he gathered a plant or two and gave them to Mr. Spicer. It took him several days’ journey to reach the spot, but he was shooting by the way. Tigers abounded, so did fever. Mr. Spicer begged his manager not to return. The same motive, doubtless, caused the planter to be reticent towards others. “With a clear conscience and heartiest thanks, Fostermann bade his host farewell next day. He had a long and painful search before him still, for his informant could give him no more than general directions. The plant grew upon rocks along the bed of a stream to the northwest of Mr. Spicer’s plantation, not less than two days’ journey from the river – that was about all. The inhabitants of the country, besides tigers, were savages. “Many a stream did Fostermann explore under the most uncomfortable circumstances, wading thigh-deep, hour after hour, day after day. To search the upland waters would have been comparatively easy; he might have walked along the bank. But the Cypripedium grew in a valley; and nowhere is tropical vegetation more dense than in those steaming clefts that fall from the mountains of Bhutan. To cut a path was out of the question; the work would have lasted for months, putting expense aside. It was necessary to march up the bed of the stream. “Then arose the difficulty of getting his plunder away. After much journeying to and fro, Fostermann engaged 32 Bhutias, half of them to carry rice for the others along these mountain tracks, where 25 pounds is a heavy load. So they travelled until, one day, after halting at a village, the men refused to advance. The road ahead was occupied by a tiger – I should mention that such alarms had been incessant; in no country are tigers so common, or as dangerous, as in Bhutan…. Gradually the poor fellow perceived that he must abandon his enterprise or clear the path………. Towards sunset he took a rifle and a gun and sallied forth. “The Bhutias assured him there was no danger – from this enemy at least – until he reached the neighborhood of a particular tree; but we may imagine the terrors of that lonely walk, which must be repeated in darkness, if he lived, or if the tiger did not show…. He recognised the tree, an old dead stump overhanging the path, clothed in ferns and creepers. Surveying it as steadily as the tumult of his spirits would allow, in the fading light he traced a yellow glimmer among the leaves. Through his field glasses, at twenty yards’ distance, he scrutinised this faint shadow. The tiger grew impatient – softly raised its head – so softly behind the screen of ferns that a casual wayfarer would not have noticed it. But it was the hint that Fostermann needed. With a prayer, he took aim, fired, – threw down his rifle and snatched up the gun. But crash – stone dead fell the tiger, and its skin is now a hearthrug on which I stood to hear this tale.